I have a 2 X 120 mm radiator that has the capability to mount a couple fans on top and on bottom. I have four fans and wanted to know if I would get the same airflow if I put two fans on top of each other instead of mounting two to the top and two to the bottom? You will not get the same performance between the two. Your better off going to thicker fans not stacking them together on the same side. I did notice that there was increased airflow using two fans on top of each other versus just one fan. Would seem like two fans back to back would pull more air almost the same as two fans on top of and two fans on the bottom of the radiator only difference being that in the latter there is a radiator between the fans. I think I see what you're getting at though. One way I have a couple fans pushing air and a couple pulling air through the radiator versus just four fans pulling air through the radiator. 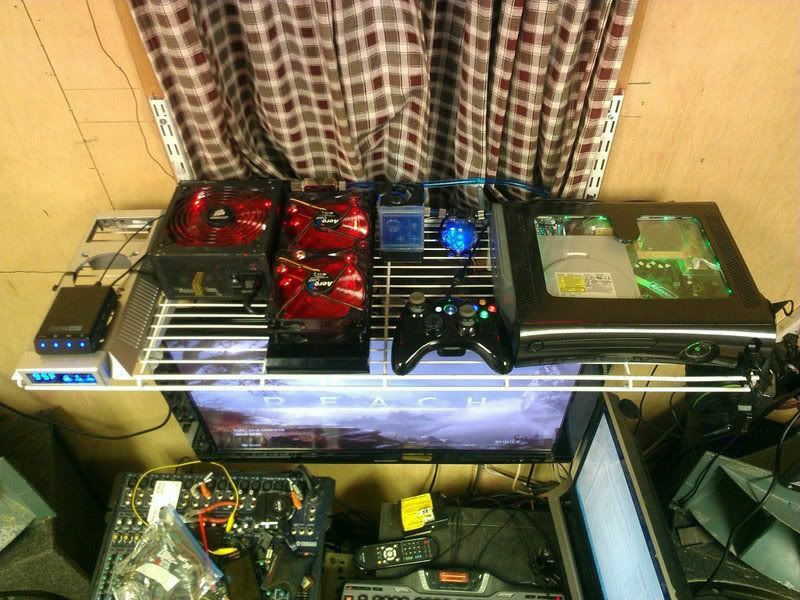 Reason I don't really want a couple fans on the bottom is due to the fact where the shelf is I would have the light from the LEDs in my eyes which is not good while playing Xbox360. I could always find some metal and cut it to fit around the sides of the bottom two fans and extend just past the mounting nuts then paint it black. I did kind of like seeing the red glow from under the shelf though. My friend I think you need to pick up your room and make a better stand LOL. But so far that is a neat little setup for a console. Ace0751 wrote: My friend I think you need to pick up your room and make a better stand LOL. But so far that is a neat little setup for a console. 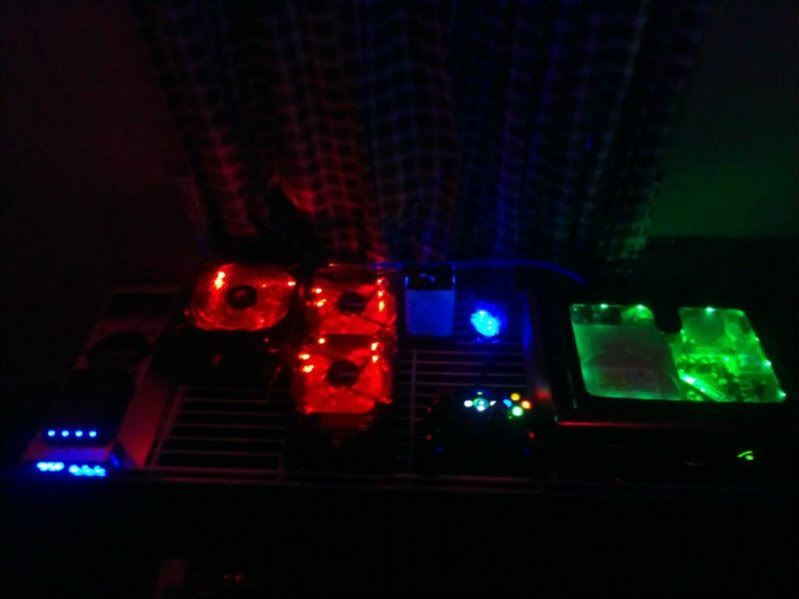 Good thing about it is when the next Xbox comes out I can simply remove my current Xbox and them install water blocks in the new one and connect it in the loop and midofy it to run on the same computer power supply if possible. Yes I do need to clean up some. You will still get an improvement with stacked fans compared to singles just usually not as much as an improvement as a push + pull. If the LED's in the fans are a problem just remove the leds. I have some 140mm variants of those fans and remember that the LED's looked fairly simple to disable. There is even usually enough tolerance between the shroud and blades that a couple well placed pieces of electrical tape might even do the job. I'll move two fans to the bottom today and see how much the light bothers me if at all. Well we don't know for sure what the new specs will be like for the new system but most of the stuff you can keep but nothing for certain yet. Oh ok. If it is only a processor and GPU I have to cool and there's room I suppose that I could use the next size up tubing and split it in two inside the xbox then using the tubing I currently have so each gets it's own cool liquid. Wish I had the room for that in the 360. Wonder if the next Xbox will be larger or smaller than the current xbox? Thinking about it is had I not gotten the case I have I could have bought that computer style case which was made for the 360 and then mounted everything inside out of view or I could have simply cut a hole in the top and used a drop in Koolance system. I like how the computer power supply could be adapted to work with the 360 as everything turns on and off with the power button on the 360 and things like the fan controller board, pump and flowmeter converter can just be plugged in. I do have a blacklight mounted to the ceiling above the xbox so the tubing will glow at night. Cooling loop is finished and working great. EDIT: I decided to try a very unscientific method to determine which fan mounting option was best. I used a spare 120 mm fan with its power wires connected to a DC voltmeter with the fan on top of the running fan. 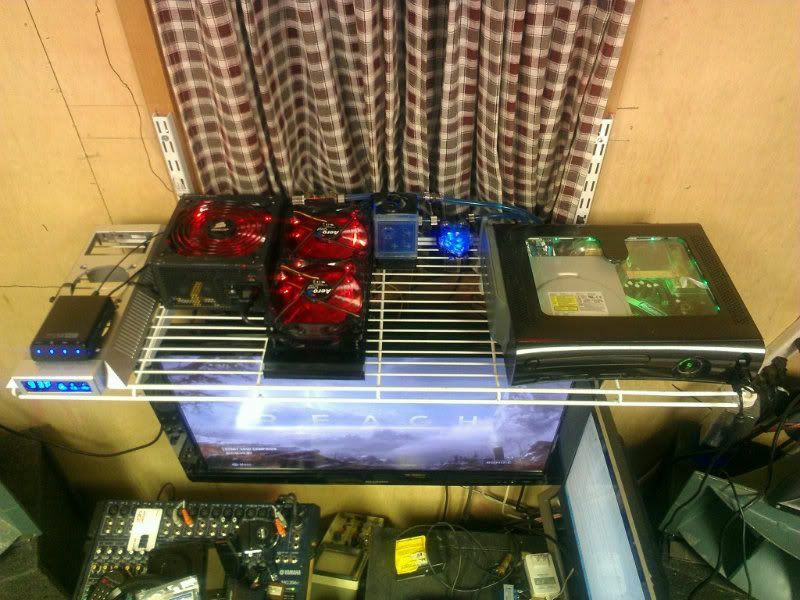 Temps shown are with room temperature more than likely about 80F and fans at full voltage. The airflow seems to have increased a bit with the fans on top. I do notice there is a very tiny gap between the fans and radiator. Will that tiny gap allow air to come through or will it be ok and if air is getting through how should I close the gap? Running with both fans on top at the slowest fan speed with room temperature about 72 F I can get usually around 87 F coolant temperature.